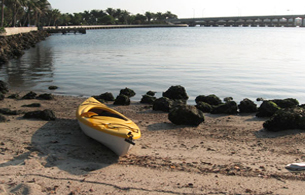 Kayaking the Lake Worth Lagoon is a great way to get closer to our local natural ecosystem. The City of Lake Worth borders 4 miles on the Lake Worth Lagoon. This valuable urban estuary is separated from the Atlantic Ocean by barrier islands. Two permanent, man-made inlets, the Lake Worth Inlet and the South Lake Worth Inlet, make it possible for saltwater to mix with freshwater from canals. The Snook Island Natural Area is easily accessible from Bryant Park. Additional improvements expected to be complete in January 2012 will include a 545 foot boardwalk with observation platform. A 590 foot fishing pier and an additional 12 acres of mangrove, seagrass and oyster reefs. The Snook Islands provide a unique habitat for native and migratory wildlife and is home to the American Oyster Catcher, Osprey, Herons, Egrets, Manatees and more. The City of Lake Worth is part of Florida's Circumnavigational Saltwater Paddling Trail and was also the first registered Florida Blueway Trail.